Please read through the questions below to see if they provide the answer you're looking for. Don't see the solution you're looking for? We're happy to help! Reach out to the Grant Committee directly by sending an email to grants@impacttc.org. Please do not email grant application-specific questions to Impact 100 TC members directly. For a detailed timeline of the entire Impact 100 grant cycle, please see the grant timeline. Agency requested less than $100,000. More than one application came from an organization. Program proposed or agency is not viable or transformational. We are a small Non-profit and very new, will we still be considered? You may want to consider collaborating with another nonprofit that has a proven financially stable track record. If you have not had an audit, our Grant Committee will require a justifiable reason as to why. Will Impact 100 decide which Grant Review Committee will review an application? When a nonprofit is awarded a grant, then the organization must wait three years before reapplying to Impact 100 for another grant. The 2 year period for grant recipients to re-apply begins the year that the grant is awarded no matter if the grant money is distributed lump sum or via installment payments according to the terms of the grant agreement. (Example: Nonprofit X received grant in 2017. Nonprofit X would be able to re-apply in 2020. Year 1 = 18, Year 2 = 19). Can we include our brochures, annual reports and videos about our organization? Impact 100 invests the grant money as a one-time payment or as a milestone payment (installments). A grant applicant may request either type of payment in the application. However, Impact 100 reserves the right to pay the grant in milestone payments if Impact 100 determines it is more fiscally responsible to do so. The period of time the money must be spent correlates directly with the project’s intended implementation timeline. Our milestone payment policy requires that the recipient provide Impact 100 with regular interim reports detailing the progress of both the project and its budget while milestone payments are being received. Impact 100 does have a maximum expenditure time frame of 2 years for when the money must be spent. What are the 5 counties from which Impact 100 will accept Grant Applications? Non-profits located in Antrim, Benzie, Grand Traverse, Kalkaska, and Leelanau counties. Funds must be spent in one or more of the same 5 counties. Yes. Collaborating proposals should meet the following criteria: a) Two or more 501(c) nonprofit organizations; b) Be aware and submit letters of support for the collaboration (Grant Application stage) c) Engage one of the partners as a lead fiscal agent through which all Impact 100 business is conducted. If a project application is a multi-agency collaboration, Impact 100 requires financial information from all collaborating partners during the “Grant Application” stage of our process. Please note each partner should submit complete financial data for three years as outlined in the grant application checklist. Yes! Nonprofits may spread out their award but it is not required. The distribution timetable does not impact your likelihood of receiving a grant one way or another. Does Impact 100 fund current operating expenses? No, Impact 100 grants are meant to be transformational. While the definition of transformational varies among members, we cannot fund an organization initiative that does not intend expansion or services delivered in a new way. An appropriate funding request for Impact 100 would be for services performed in a new way (innovation), more services of the same kind provided more often to their current population (deepening), or expanding their current service to a new population (expansion). Impact 100 would expect the budget to reflect such, which could include additional staff & their resultant operating costs or other capital requests. Impact 100 welcomes Applications that are programmatic, capital, start-up, or technical assistance from valid 501(c)3 organizations. We do not fund overhead requests. Our funding cannot be used to advance faith-based programs (e.g. build a chapel) but can be used by a faith-based organization to address social issues. Our grant amount fluctuates every year based on the number of members we have for that year, yet each recipient in that year would receive the same amount. Each time we accumulate 100, $1,000 donations, we are able to grant a minimum $100,000 award. Yes. Impact 100 is interested in your project budget and even though it is not officially approved, it must still be a realistic budget. Please note that the process asks you to confirm that the non-profit Executive Director and/or Board President are aware of the application. Grant recipients are responsible to spend all funds in the manner with which they applied for the grant. Do you look to fund only “new impacts” or would you consider supporting previously awarded impact areas? Impact 100 prides itself on its ability to maintain a level playing field amongst all applicants. In addition, due to the ever-changing makeup of membership and committee involvement, any advice given might actually be invalid and misleading into a next year. Therefore we do not offer feedback and just ask you to attend the information sessions that we offer and are open to everyone. Applications are submitted online. See the "Process and Timeline" page for deadlines and the Grant Application page for application instructions. For technical questions regarding our online application, please contact SlideRoom at support@slideroom.com. For questions regarding Impact100’s guidelines or process, you may email grants@impactTC.org. If we have questions about your Grant Application, we will contact you. Impact100 Traverse City is committed to a fair, unbiased process. We do not accept any unsolicited communication related to topics other than questions about the guidelines or application process. Yes. You must identify the additional funding sources for your proposal on the Full Proposal Budget Form. As stated in the grant guidelines, Impact100 seeks projects or programs that expend grant funds within 2 years (24 months). 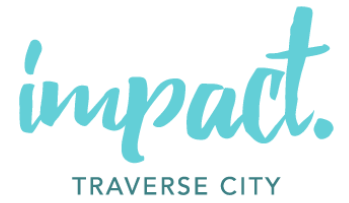 What kind of communication can we expect from Impact100 Traverse City during this process? Impact100 notifies all applicants at each stage of the application process, even if they are not invited to receive a site visit or become a finalist.